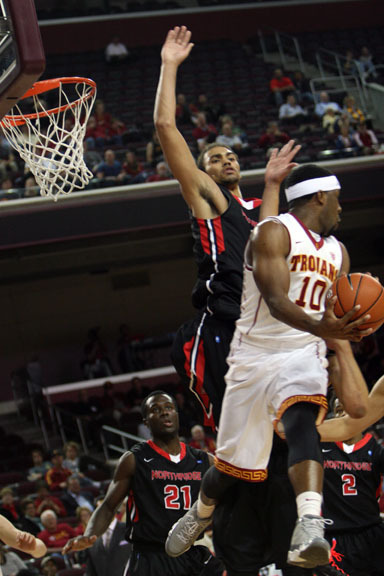 For just the second time all season, Pe’Shon Howard did not start for the Trojans. For the first time all year, he didn’t suit up for the Trojans at all. Instead, he dressed in warm-ups on the Trojan bench as the USC lost 83-74 to Colorado. Bryan had 7 points in the first half to lead the Trojans, but the undersized Trojans struggled to contain Colorado on the perimeter, as the Buffaloes hit five three-pointers in the opening half. “It’s self-explanatory.”…Andy try to ‘coach’ off the floor as well building up your players at all times -considering combat time, Byran’s and Jacob’s performance was commendable! Andy, how’s your 2nd half performance? The word is Pat’s decision was/is questionable!!!!!! !